Alternative post title: No, really, I’m not kidding. I *really* want to give you money. Part of the software stack/services that we have at my employer is a billing system for ISP environments. Given this, the typical features you would imagine to have in your billing system for such an environment would include the ability to bill for physical connections as well as services rendered over those connections. Possibly even just having the services without the connection. Do we have all of those? Check. Other things you might want? Hmm, let’s see, online management of your products and services? Check. Ability to pay online using credit card etc? Check. Fault logging? Check. The reason I list all these things? Because I want to show that I’m not completely unfamiliar with billing systems and/or the challenges associated with them. 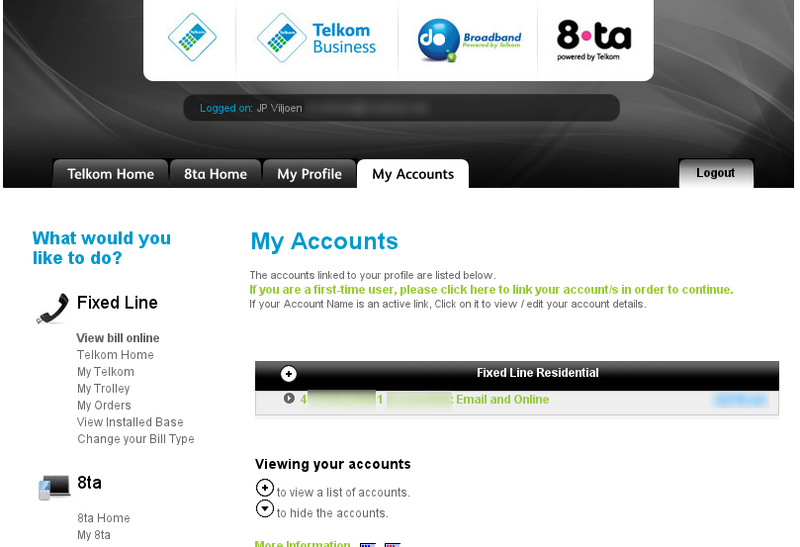 With that all in mind, let’s go over to the Telkom SA billing site to pay our DSL connection bill (check out all the options you have for doing this over here). So I do all the things required for getting my bill online [edit: I've actually done this a few months ago, this post is just coming up now because the issue is causing me problems now] and then open it here, as the page says I should. Hey great, it shows me some stuff! Not too bad so far. Let me click on that View bill online link on the side. Well, uh, that’s nice. No listed invoices. And the My Accounts page linked to from the first paragraph takes me to the page I just navigated from. 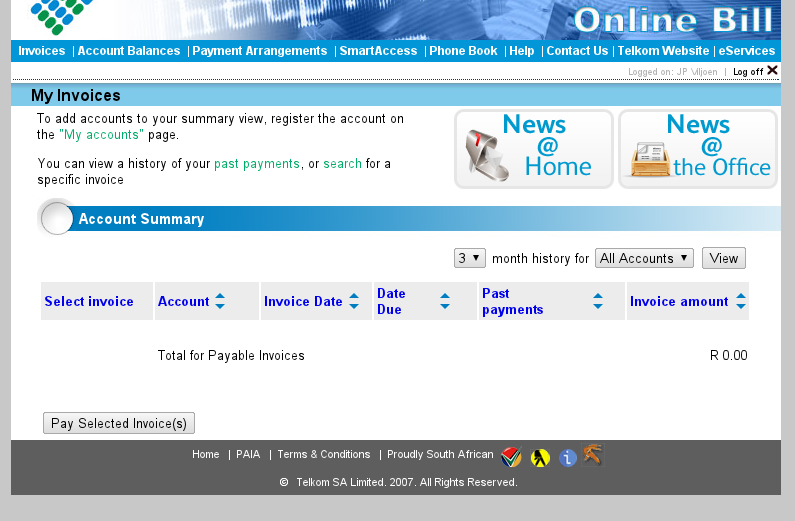 Can’t view past invoices or search for any with success either. So I have no option for immediately paying my bill and get to go with any of the other options that range from mildly to highly inconvenient for me. Great, thanks. I’m attempting to contact the Telkom Online Billing department, and will be using this URL as the summary of the complaint; mostly because I’ve gotten so damned tired with having to spend 5 minutes repeating the issue to every new person in the callcenter that I get redirected to each time I phone in an attempt to sort this crap out. Who knows, with any luck I might even be able to get some useful information about how other people could solve this if they also run into it.